Doddington Place is surrounded by wooded countryside in an area of outstanding natural beauty. 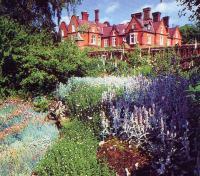 The lovely landscaped gardens are set in the grounds of an imposing Victorian mansion and cover ten acres. There is a notable woodland park - spectacular in May and June - which includes many different varieties of rhododendron and azalea; also a large Edwardian rock garden with pools; a formal sunken garden with borders - at their best in late summer; and a recently completed flint and brick folly. Extensive lawns and avenues are framed by impressive clipped yew Hedges and many fine trees.